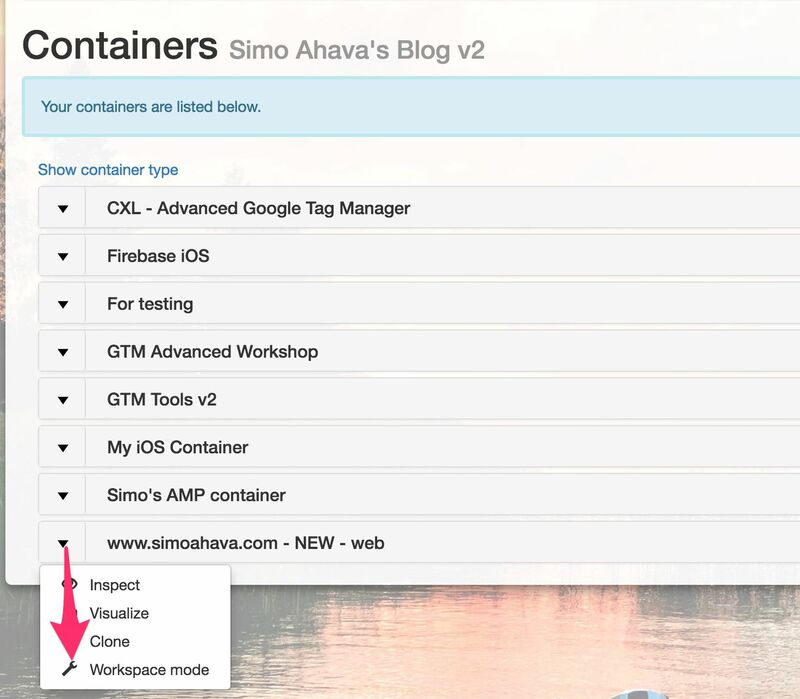 It’s time for a big feature update to my GTM Tools, a free tool for managing your Google Tag Manager containers, tags, triggers, variables, and now: workspaces. In this article, I’ll quickly go over the main features of Workspace mode. Be sure to check out the updated Release Notes & User Guide. Workspace mode is a pretty big departure from what GTM Tools has been capable of until now. For long, I had been trying to figure out how to elegantly allow mass-updating individual items within GTM, but finally I found the time to make things work, utilizing workspaces to keep things in check. Pause / unpause selected tags. Edit the folder of any given item. 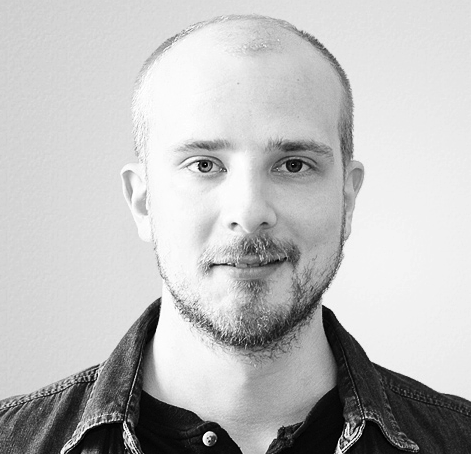 Edit the raw JSON of any item. As you can see, the feature list is limited. But I’ve built the mode in such a way that adding new features will be easy in the future. I’m looking forward to adding things like removing unused variables and adding triggers to tags. Here are some things you should know about Workspace mode. It does not display changes made or conflicts existing in the workspace itself. This is something I hope to add soon. Changes are made only in the current workspace you are editing. Perhaps at some point I will add the option of copying items / changes to another workspace, too. If you edit the raw JSON of an item, then any other changes you make will override the changes in the JSON. 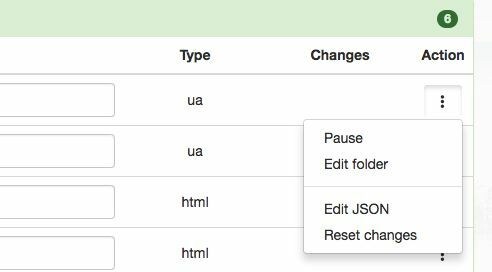 In other words, if you, for example, pause an item using the Workspace mode “Pause / Unpause” action, and then you also set the flag paused to false in the JSON, the pausing action will override the change you made directly in the JSON. Those are the main caveats at the moment. As always, editing items is at your own risk. Remember that any changes you make to the workspace can potentially disrupt the work others have been putting into it. Thankfully, workspaces is a pretty solid feature itself, so if you make silly changes, it’s easy to roll back by either abandoning individual changes or just deleting the whole workspace and starting from scratch. The Changes column will also display an icon reflecting each change. Finally, the respective Actions menu selection will be bolded if a change has been made there, and if you change the name of an item, the name field will be bolded, too. Naturally, each selection in the category header only applies to selected items within that category. Paused tags are indicated with a grey background. You can change the pause status of a tag by choosing Pause / Unpause from the Action menu, or by selecting the tag and changing its status using the category header. You can change the folder assignment of a single item via the Action / Edit Folder option. You can change the folder assignment of multiple folders at once by selecting them first (by clicking their respective checkboxes), and then choosing edit folder from the category header. When you choose to edit a folder assignment, a new overlay will pop up. If you chose Edit Folder through the Action menu, then you’ll see the current folder for the item in bold font (or (none) if the item doesn’t belong to a folder). 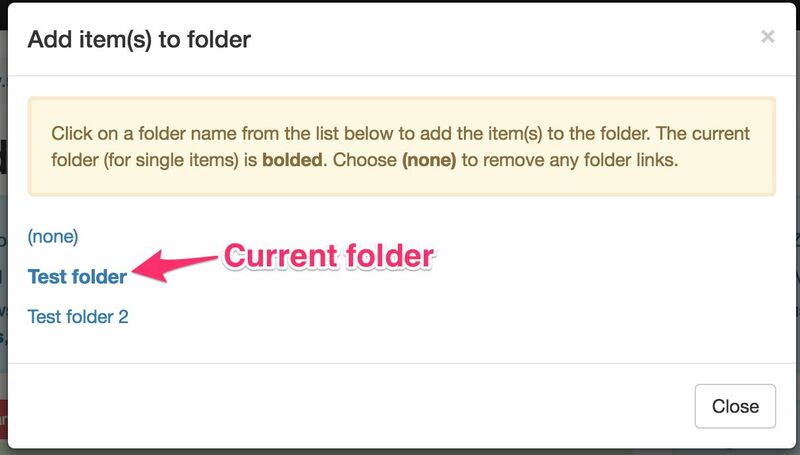 By selecting a folder in the list of folders, all the selected items will be added to this folder. You can change the name of any item by simply editing the text in the text field of the Name column. All changed names are shown in bold font. You can edit the raw JSON of any item by selecting Edit JSON from the Action menu. NOTE! This is completely at your own risk. If the JSON has even a single field in the wrong place, a required field missing, or a misconfigured value, the item will not update. 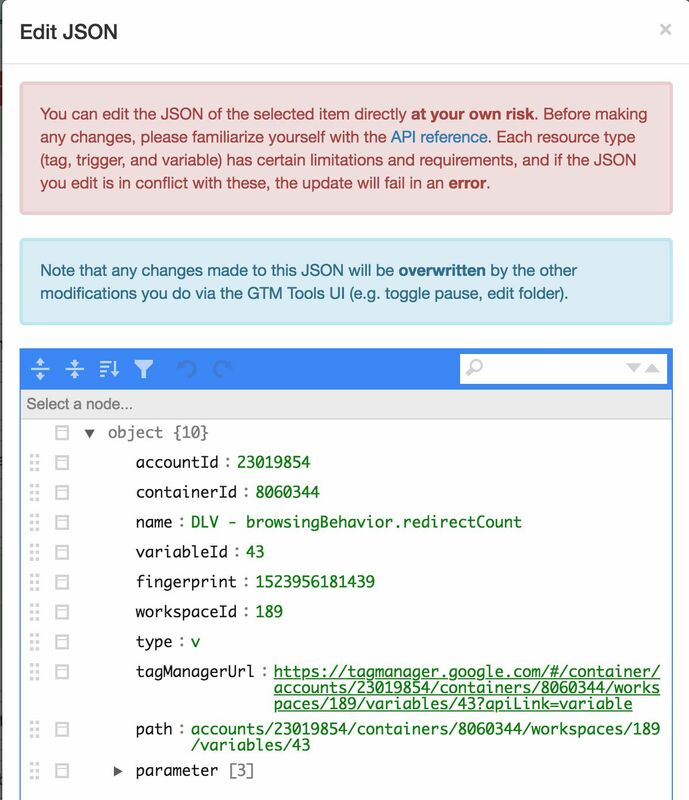 Be sure to familiarize yourself with the resource requirements of the GTM API: tags, triggers, and variables. Note also that any changes you make to the JSON will be overwritten by other changes you make via the Workspace mode UI. So if you, for example, change the name of the item in the JSON to “New name”, but then you type “Some other name” into the name field, the final value will be “Some other name”. The Edit JSON makes use of the open-source jsoneditor tool. 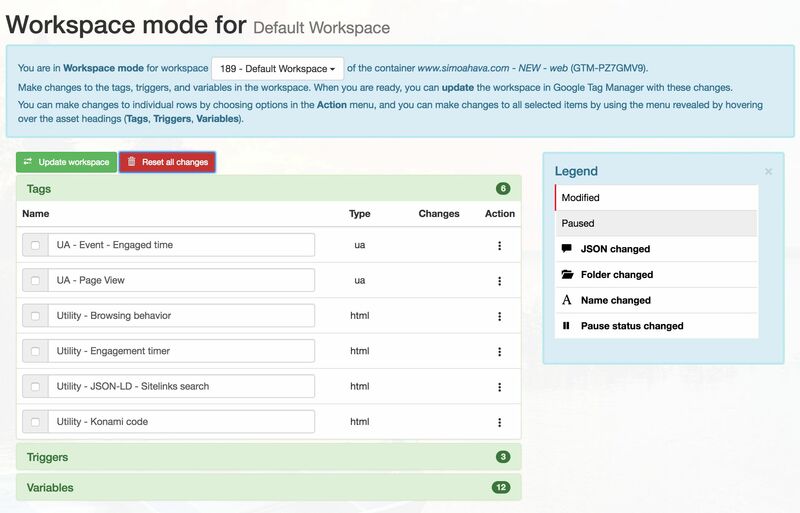 You can reset any changes made in Workspace mode by choosing Reset changes from the Action menu, or the respective selection in the category header when you’ve selected one or more items. Do note that Reset changes only applies to changes made in Workspace mode. It won’t reset any changes you’ve made to the workspace in the Google Tag Manager UI. 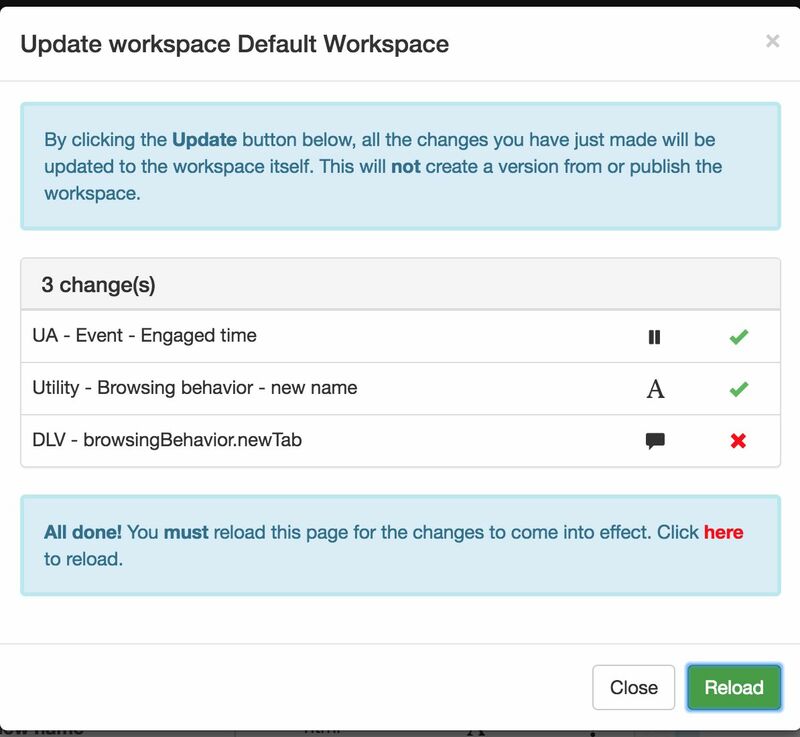 Once you’re ready to update the workspace with the changes you’ve made, click the green Update workspace button, and a new overlay will pop open. There will be a list of all the changes you’ve made. Once you’re ready, click the green Update button to start the update process. The update will process each item one at a time, and once the update is complete, a green checkmark will appear next to the item. Any items that failed to update (due to e.g. JSON errors) will have a red cross next to them. Once the update is complete, you must reload the page. Otherwise the workspace loaded in Workspace mode will not be synchronised with the latest changes you just updated the workspace with. These were the main features of Workspace mode. I will be adding new stuff to it over time, but I won’t update this article to reflect the new additions. Instead, I recommend you follow the Release notes & User guide as that will (hopefully) always be up-to-date with the latest features. Please let me know in the comments what you think of this release, and what suggestions you might have for future iterations of Workspace mode!